Super-Resolution is the problem of obtaining a high-resolution version of one or more low-resolution images. In most super-resolution approaches, the camera degradation model must be known in advance. In this project, the goal is to develop a blind super-resolution algorithm using a supervised learning framework. (Researchers: Isabelle Bégin and Frank P. Ferrie). When searching through video archives for particular scenes of interest, the amount of data is too overwhelming for a human operator to be usefully parsed. The general field of content based video indexing aims to make this task manageable by automatically categorizing and indexing video content. An algorithm to detect and categorize scenes using psychophysically correlated motion metrics would enhance the state of the art for this field. (Researchers: Prasun Lala and Frank P. Ferrie). Generated by a space carving algorithm, the photo hull can at best serve as a rough model to the scene. Using photo hull as a regularizer, a regularization-based stereo method is investigated. A refined depth map is expected because photo hull can help the stereo algorithm by reducing the search space of the algorithm as well as to solve the occlusion problem inherent in stereo. (Researchers: Shufei Fan and Frank P. Ferrie). We imagine the following situation. Given a set of visual sensors (cameras) with minimal knowledge of their operating parameters, we place these cameras in an open complex environment. We would like the cameras to collaborate autonomously, i.e. communicate and exchange information, in order to derive a fine detailed 3D representation (a.k.a. visual model) of the complex environment under consideration. (Researchers: Karim Abou-Moustafa and Frank P. Ferrie). More details to come. (Researchers: Prakash Patel and Frank P. Ferrie). New project! More details to come. (Researchers: John Harrison and Frank P. Ferrie). Intelligent data fusion for aircraft navigation and disaster management. (Researchers: Isabelle Bégin, Prasun Lala and Frank P. Ferrie). CoRIMedia is an academic research consortium on digital imaging, video, audio and multimedia processing. The Enhanced and Synthetic Vision System (ESVS) is a Canadian Forces Search And Rescue (CF SAR) Technology Demonstrator project to help SAR helicopter crews see in poor visibility conditions. The accurate calibration of monocular cameras is crucial for many precision vision systems. Accordingly, many techniques have been introduced to solve this problem, each having its own set of limitations/requirements. The main intent of our work was to provide practical guidelines for the implementation and assessment of 14 state-of-the-art camera calibration methods found in the technical literature. In this work, we introduce the notion of entropy maps, and show how they can be used to guide an active observer along an optimal trajectory, by which the identity and pose of objects in the world can be inferred with confidence, while minimizing the amount of data that must be gathered. We have introduced a paradigm called the Interactive Visual Dialog (IVD) as a means of facilitating a system's ability to recognize objects presented to it by a human. The premise of this work is twofold: i) that an object can be recognized on the basis of the optical flow it induces on a stationary observer, and ii) that a basis for recognition can be built on the appearance of flow corresponding to local curvilinear motion. The APL was one of the first laboratories to own a laser range finder. A laser range finder is a non-contact device that can measure the shape of a surface in 3D. In collaboration with the NRC (National Research Center), a sophisticated synchronized laser scanner, with precision of up to 0.1 mm, was developed. Over the years, the technology has become more accessible and the APL has developed its own custom design low-cost range finder. 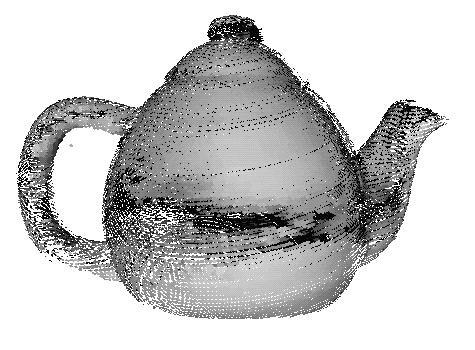 Given that the geometric models can be extracted automatically from range data, it becomes possible to recognize the parts of an object. As shown in the right image, the problem consists of matching a part of a scanned object with a set of parts already stored in a database. The belief level of this match is returned and can be used to perform formal object identification. 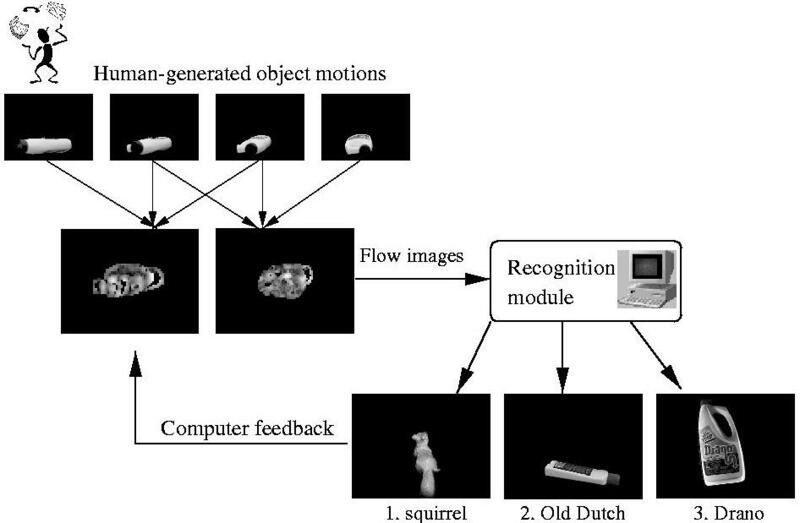 More recently, the Artificial Perception Laboratory has become interested in the computation of video flow resulting of the motion of an object on front of a video camera. This ongoing research has gone from traditional pixel to pixel image comparison to more sophisticated frequency space analysis methods. The quick and accurate indexing of image databases has become an interesting research topic as the access to large databases becomes easier. Current indexing techniques use commonly the appearance of the object to match them into a databse. These techniques can easily be fooled by change in illumination. We study the limits of these fast indexing techniques and how they can be improved. This research presents the concept of an Enhanced and Synthetic Vision System (ESVS) that could help aircraft pilots see in low visibility conditions. The basic idea is that synthetic and infrared imagery would be fused to maximize image content. In many situations, a CAD model of an existing object is required for manufactoring or in order to perform design modifications to an object. In this example, a prototype of a virtual reality helmet was digitized for CAE Electronics Ltd. The top image shows a grid representration of the final model. On the bottom, an artificially shaded surface renders the same surface. 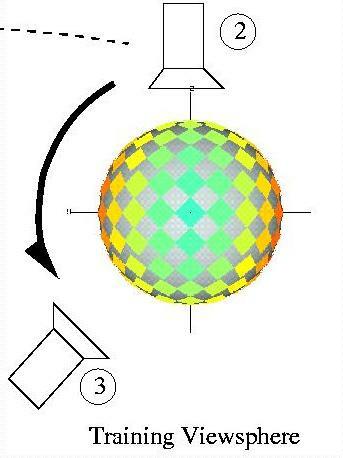 A range image is composed of a large number of discrete 3D points. They are in general sufficient to represent completely the object. However, the surface between the points is undefined and has to be interpolated in order to reproduce it with most prototyping techniques. The NURBS (Non-Uniform Rational B-Spline) representation are commonly used to perform this interpolation. It has the double advantage of interpolating the data and reducing the data substantially. The top figure shows a raw range image of an Indian mask. The bottom figure shows the same information with a coarse NURBS grid. This work was done in collaboration with Hymarc Ltd. Many people with abnormal feet require custom design shoes. For the most part, this involves a tedious process of precise measurements and the intervention of an experienced shoemaker. In this feasibility study, an attempt to automate the whole process was done. The most important design parameters can be changed for the customer and visualized immediatly. The top figure shows the heel height selection and the bottom figure shows the toebox shaping. The study was done in collaboration with Telemars Recherche et Developpement Inc.
With current non-contact scanner technology the dense digitization of complex objects can be done relatively quickly and to a high level of precision (25 mm). The process is in general totally left to the expert hands of an operator and the assessment of the overall quality of the surface coverage is mostly subjective. 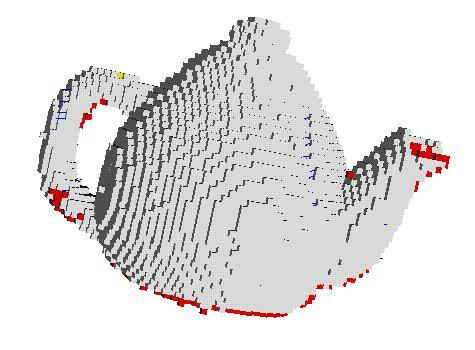 Using the design developed at the APL indicates that any holes on the surface of an object (red cubes on the top figure) can be detected reliably and can provide a completion criterion to the digitization process. The bottom figure shows the scanner path followed to perform full surface coverage. This work was done for Hymarc Ltd. In hostile environments, such as in space or in nuclear plants, human intervention must kept as low as possible. Computer vision and robot teleoperation must be tightly coordinated in order to perform the complex tasks efficiently. The number of vision sensors is limited and some objects will inevitably be hidden or occluded. Any action on these objects requires that their location be computed precisely from their relative position to the visible objects. The left figure shows a test object where three components where used to deduce the location of two targets in the right image. This work was done for Hymarc Ltd. The Artificial Perception Laboratory has done many collaborations with other departments inside McGill University and hospitals to acquire and process range data required for various statistical analysis. The left image shows a collaboration to a project where the curvature of the bones of the knee was modelled and then compared to real data in order to produce artifical implants. The right image shows a similar project where the surface of 229 vertebraes was scanned to evaluate the average dimensions for various age groups. In collaboration with the McGill Civil Engineering Department, the surface of many large granite rocks (3 feet diameter) was scanned to measure the effect of high pressure water infiltration in rock fractures. The surface of the rock was scanned right after the rupture (top picture) and compared with a scan of the same rock after putting the two parts back together and applying high force constrain and water pressure in the fracture. The bottom image shows the color-coded surface difference of the surface "before" and "after".